I have mentioned my ‘irrational’ attachment to inanimate objects before, please see my entry My House if you feel the need for further enlightenment. Recently a bone of contention Chez Here has been our sofa. I, for apparently totally illogical reasons, do not. Want to get rid of our sofa. I did part with the two armchairs which went with the sofa. And swapped them for two trendier, Scandinavian inspired, easier to get out of numbers. I liked my old chairs which I could curl up in. And they had great padded arms for sticking pins into when sewing. But I parted with them. They wouldn’t really have fitted in the Family Room anyway. The charity that came to collect them were very pleased. And so I have high hopes for their onwards adoption. The sofa, however, presents me with even more issues. It, along with those chairs, was the first piece of furniture my husband and I bought together. At the time, not that long married and having just upsized to our second house together, it was a large expense. And I still remember the thrill of that purchase. And waiting eagerly for it to arrive. Freshly Scotchguarded. That decision to Scotchguard or not seemed to confirm my arrival in the adult world. It was quite a daring purchase as the pattern was quite busy. And it was in a different fabric to the chairs. Yet we were living in a very bland house (my husband picked it- it was an ex show home on a newish estate and I dubbed it Beige Hell from the outset) and it fitted in perfectly. Adding colour and interest to the otherwise boring living room. When we moved down here we picked our new carpet to go with it. I have always found it extremely comfortable. Apparently all my relatives find it terribly uncomfortable. And hard to get out of. I, on the other hand, like to curl my legs up and sit in the corner and it is perfect for that. And you can balance a cup of tea on the arm. When I am sitting upon it I feel enclosed and hugged in the best possible way. It does eat remote controls but I can forgive it for that. My husband and I have our own ‘ends’. It is easy to sleep on which I found very useful in late pregnancy, in the early days with newborns and when I had pneumonia and couldn’t stop coughing and had to decamp downstairs. To avoid my husband getting no sleep either. It is big enough for all of us to sit on. 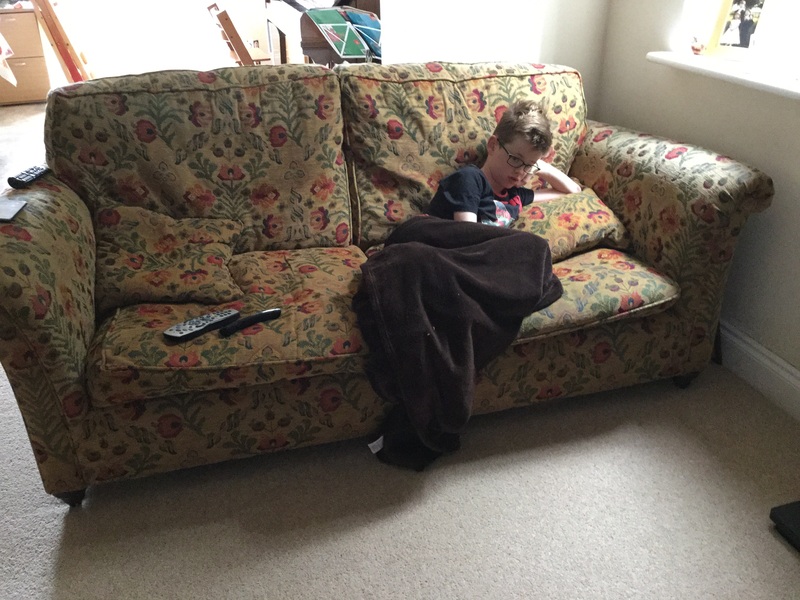 I have spent many, many happy hours snuggled with my offspring watching TV. From In the Night Garden to Horrid Henry to Strictly Come Dancing to Bake Off to Top Gear (yes really, not sure why) to Harry Potter, through every Disney film ever made (well maybe not but you get the gist). I gave birth to Youngest on it. In the best and obviously last of my three birth experiences. All my children have pulled themselves up to standing for the first time on it. Vomited on it. Wee’d on it. One has even poo’ed on it. Hmmm I may be re-thinking. And incidentally that extra fifty quid on the Scotchguarding was sooo worth it. So yes it is old. And slightly ripped. But I love it. For all sorts of reasons.